Until recently, Fibre to the Premises (FTTP) has been the sole solution for businesses wanting high speed broadband. However, as part of the national nbn rollout, a different type of high speed broadband is now available. 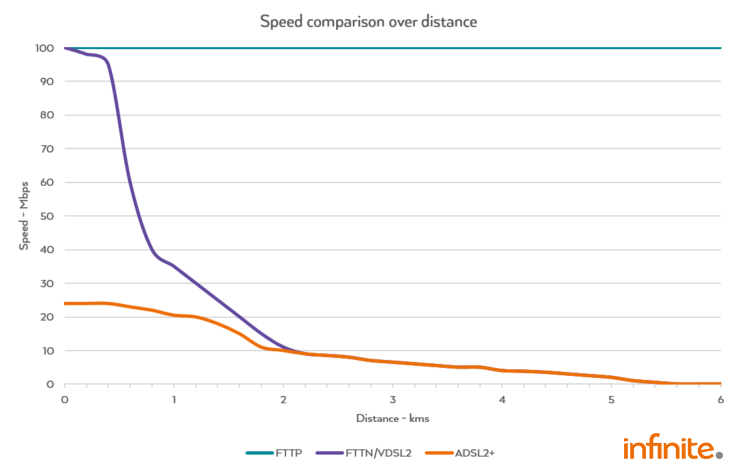 Fibre to the Node (FTTN) or VDSL2 is currently being delivered to buildings where FTTP is not available or where it will take time to be installed. So what does this mean? Firstly let’s explain the difference between delivering Internet services over copper versus fibre. Put simply, copper uses electrical signals and fibre uses light waves. What are the key differences between fibre and copper? Fibre to the Premises (FTTP) utilises fibre all the way from your building to the Point Of Interconnect, the connection point that allows Internet Service Providers, such as Infinite Networks, to connect with the nbn. 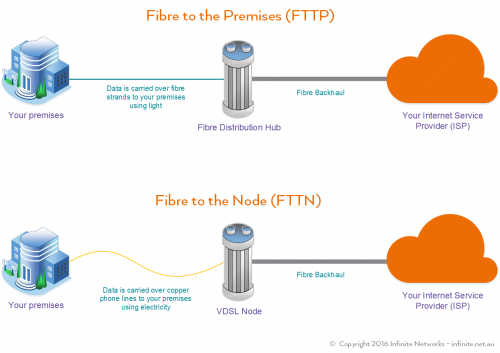 Fibre to the Node (FTTN) utilises your copper based phone line to a node located in your suburb usually 10m to 1km away, and then from the node back to the Point Of Interconnect. To illustrate the difference between the two delivery methods, we’ve created a graphic below. So what is the difference in terms of performance? As fibre uses light to transmit and receive data, and light can travel further and carry more information than electricity, the speed your connection is provisioned at is close to the speed you will receive. Copper used in a FTTN service uses electricity. If you are right next to a node then the technology can be as fast as a fibre service but the further you are away from the node, the slower your internet speed will be. 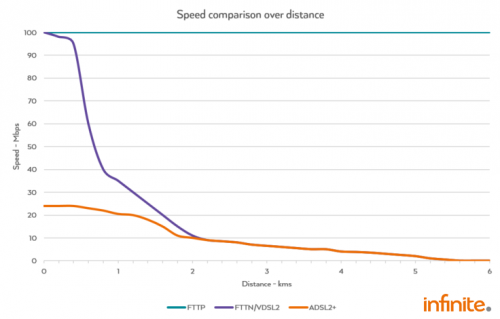 The method the nbn is using to deliver fibre to the Node is called VDSL2 and while speed can vary over distances it can also differ depending on the quality of the copper cable. The lower quality cable, the more severe the drop-off is. So why have Fibre to the Node as an option? Clearly Fibre to the Premises is the winner in terms of performance, reliability and speed but as it requires new fibre to be run to every building, older buildings may not support this option. FTTN offers an alternative. As a business, you will want FTTP instead of FTTN except when your building is in an established area and getting FTTP will take much longer to install or not be possible at all. FTTN is faster to roll out and businesses can take advantage of it sooner, but the impact to your business may be underwhelming and leave you looking for better options such as symmetrical Ethernet services. At Infinite we look forward to a day where every business has the option to be connected to a Fibre to the Premises service allowing them to contribute to the Australian economy and be competitive in a global market. Find out how your business can connect to the nbn today.